There is an invisible army of people deep inside the world’s biggest and best-known companies, pushing for safer and more responsible practices. They are trying to prevent the next Rana Plaza factory collapse, the next Deepwater Horizon explosion, the next Foxconn labor abuses. Obviously, they don’t always succeed. Christine Bader was one of those people. She loved BP and then-CEO John Browne’s lofty rhetoric on climate change and human rights - until a string of fatal BP accidents, Browne’s abrupt resignation under a cloud of scandal, and the start of Tony Hayward’s tenure as chief executive, which would end with the Deepwater Horizon disaster. Bader’s story of working deep inside the belly of the beast is unique in its details, but not in its themes: of feeling like an outsider both inside the company (accused of being a closet activist) and out (assumed to be a corporate shill); of getting mixed messages from senior management; of being frustrated with corporate life but committed to pushing for change from within. 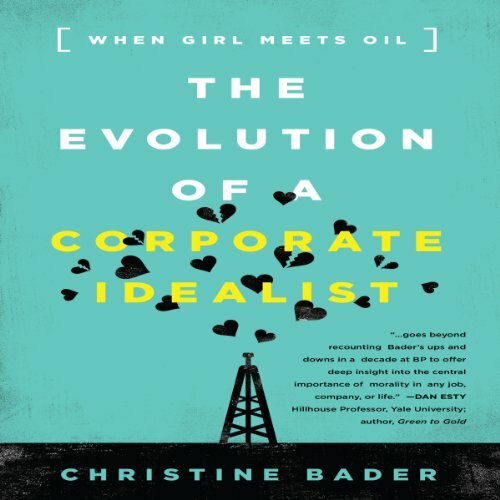 The Evolution of a Corporate Idealist: Girl Meets Oil is based on Bader’s experience with BP and then with a United Nations effort to prevent and address human rights abuses linked to business. Using her story as its skeleton, Bader weaves in the stories of other “Corporate Idealists” working inside some of the world's biggest and best-known companies. Gildan Media and Bibliomotion are proud to bring you another Bibliomotion Audiobook. Featuring exceptional content for today’s listener, these notable audiobooks contain the essential tools that can be applied to every facet of your life. In this fascinating book, Christine Bader discusses her nine years as a “corporate idealist” at BP, as well as her experience working with John Ruggie at the UN to create the historic UN Guiding Principles on Business and Human Rights. Through her personal struggles in Indonesia, China, London, and NYC, Bader brings up the issues common in the field, which is supplemented by copious amounts of interviews with NGO leaders and fellow corporate idealists. In an industry plagued by jargon and euphemism, this book shines in its captivating storytelling, fluid prose, and entertaining and honest style. It also spends a lot of time interrogating the tension inherent in the industry: whether it’s possible to do good within companies that are often responsible for human rights abuses, whether corporate idealists are self-delusional, or whether incremental progress, and working with the world’s power players is actually more realistic way to achieve change. Decent story, but the narrator sounding like she was talking to a bunch of children, with a high pitched voice and drawn out pronunciations ruined he listening experience.